While we all want the best for our cats, it's not always easy to afford taking care of them. It costs roughly $500 to $1000 yearly to take care of a cat , and it costs much more than that if your cat has health issues that require medical care. If you want to find ways to keep cat care costs to a minimum while still taking great care of your cat, here are some clever ways to save money as a cat owner. While we all want the best for our cats, it's not always easy to afford taking care of them. It costs roughly $500 to $1000 to take care of a car yearly. If you want to find ways to keep those costs to a minimum, here are some clever ways to save money as a cat owner. 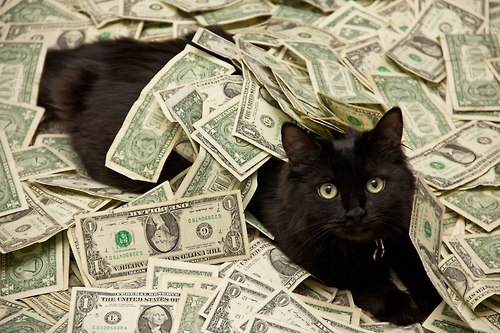 One of the easiest ways to save money on your cat is to keep your cat inside. Keeping your cat indoors can prevent both fleas and injury. Unless you own other animals that sometimes venture outside, keeping your cat inside will prevent any flea outbreaks. This will save you money since you won't be paying for flea treatments. Keeping your cat safe from any injury that can occur outside will also prevent unnecessary trips to the vet. If you want to buy cat litter, focus on using a higher quality cat litter that clumps and fights odors. The higher quality litters last longer and control odors better so in the end, it is more economical than the cheaper non-clumping cat litters. Our favorite cat litter is Precious Cat Clumping Kitty Litter and we think it is a bargain when considering overall quality. If you wish you could avoid using kitty litter altogether, think about toilet training your cat. Yes, it really is possible! The process is not difficult although it does require some patience and effort. But results of having a toilet trained cat will be well worth your time invested. Just imagine... no more buying cat litter, no need to clean up after your cat and no more cat urine orders in your home. If you are not up to the task of toilet training your cat, there are many ways you can make your own DIY cat litter. Although none of the recipes I have seen over the web are better than my favorite Precious Cat brand of kitty litter, if you need to save money, a DIY solution can be a ig budget saver. The simplest way to make your own kitty litter is to just use newspaper. The only challenge you will have there is collecting enough newspaper. It works better if the newspaper is shredded but if you already have a paper shredder, it should make the task simple and quick. Another option is to use sand. It clumps well and will not hold onto urine smells. The unfortunate thing is that sand can be easily tracked all over the house. So make sure you invest in a good cat litter mat to reduce the mess. Did you know there is a DIY recipe for DIY Kitty Litter that is very much like commercial kitty litter? They use a combination of newspaper, dish soap and baking soda. The process is pretty simple and takes only a few minutes (minus the drying time) and you can check it out here. If you are buying your cat cheap cat food, I urge you to think of buying your cat one of the recommend brands of better cat food. Although the cost of better cat food can be slightly more upfront, the overall costs of having a healthier cat will save you money over the long run. If you are buying any of the cat foods we do not recommend, please think seriously about switching to a higher quality cat food. One trip to the vet will eliminate all the money you thought you saved by buying cheaper filler cat food. To save money on cat food, look for sales and coupons. With a little bit of effort, you can get the higher quality cat foods for the same price or less than the cheap cat foods. To save money, making your own cat food or treats or feeding your cat a raw diet is healthier for your cat, and, though it takes a little more effort, is ultimately cheaper than a processed diet. There are tons of recipes for DIY cat food on the internet. Basically, you just have to feed your cat a variety of healthy protein and some bone matter (since they need protein) . There is some debate as to whether anything else should be fed to your cat, so you can decide for yourself if you want to mix in a little bit of healthy veggies like broccoli or carrots or healthy carbs depending on what your cat likes and does well on. If you are interested in making your own cat food, just search on the web for DIY cat food recipes. I found this post of diy cat foods helpful. Try to feed your cat portioned meals. Overfeeding your cat can cause health problems and more frequent visits to the vet. To save yourself money, feed your cat portioned meals, and take away anything your cat doesn't eat. To save even more money, you can save whatever your cat doesn't eat for his next meal. You don't have to throw away uneaten food, just put it away and reuse it for the next meal. 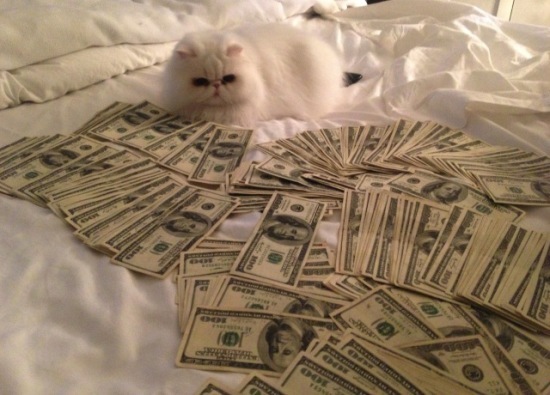 There are a number of deals available to save you money on your cat. When it's time to get vaccinations and spay and neuter your cat, be sure to shop around. The average vet will charge significantly more than your local humane society, for instance. For your average cat supplies, pet stores frequently have sales and offer coupons. Online discount codes are also available if you're a person that likes to shop online. One of the best resources for deals on pet supplies is SlickDeals. Just go and check the site when you need pet supplies and see what deals are going on that week. You may not think about getting deals on pet supplies the week of Black Friday, but it's a great time to get deals on pet supplies. If you are open to it, you can also try dumpster diving at your local PetSmart or Petco or other pet focused store. One of my friends does it once a month and she always can't stop bragging about all the great stuff she scores from checking out the trash container of her local pet store. I personally have concerns about doing that, but you may be bolder than me. You can also try asking the manager if there may be returned or discarded items they may be able to give you. Although it may seem cheaper to buy a smaller amount, buying in bulk will also save you money in the long run. You can find bulk supplies online, or in stores like Costco and Sam's Club. Cats are great at grooming themselves but they still usually need a little bit additional grooming care. Instead of going to a groomer or a vet to groom your cats, do it at home. Professional grooming can be expensive, so this simple procedure can save you a lot of money. Simply remember to bathe, brush, trim your cats claws, and brush your cats teeth routinely. Here's some great tips for caring for your cat's claws. Plan to visit the vet yearly and do annual checkups. Alhough visits to the vet might seem expensive, regular checkups can actually save you money. Preventative medicine can be critical in avoiding more expensive illnesses down the road. A regular vet checkup will help your cat maintain optimum health, and catch any potential conditions early before they become a real problem. schools in your area. You can often find discounted vet care from them. Many of the available vet colleges in the United States are listed here. You can also see if any of the animal shelters or vet clinics offer discounts on vaccines or other routine care. You should also think about getting pet insurance to make regular checkups as well as other vet care a little easier to afford, just be sure to shop around for the best price when you do. We have some terrific tips of getting pet insurance here. You can get some pet insurance for $10 to $20 a month and that is much less than huge thousand dollar vet bills for injuries and illnesses. If you don't get pet insurance, try to self insure by planning for medical care for your cat, and saving a bit of money every month to use for necessary vet care yearly. Regular exercise will help your cat maintain the best health possible, prevent sickness, and save you trips to the vet. You can help your cat get regular exercise by providing toys and things they can climb and jump on throughout the house. It is also important to keep your cat well hydrated. Cats can easily get dehydrated since they don't drink enough and usually won't drink anything but fresh cool water. It may be much cheaper to get your cat a great fresh water pet fountain than to pay a big vet bill for dehydration You can see recommendations for great cat pet fountains here. You can save a lot of money you'd normally spend on toys by simply making things for your cat to play with. It's a great idea to make simple toys for your cat. If you don't make them, take hand-me-down's if they're available, or browse yard sales to see if you can find some good, cheap toys. If ideas on making your own DIY cat toys, just search on the web. Making cat toys is ridiculously simple so I rarely buy cat toys unless I am doing reviews for our pet site. You can also make your own scratching posts by simply grabbing some cardboard or a carpet remnant. Use these amazing cat scratching posts for ideas and inspiration. Cat play structures are a bit more involved but not too difficult. There are many tutorials and videos online for making your own DIY cat tree, cat condo or cat tower. Just make sure when considering which one to build you pay careful attention to the safety and stability of the structure you build for your cat. 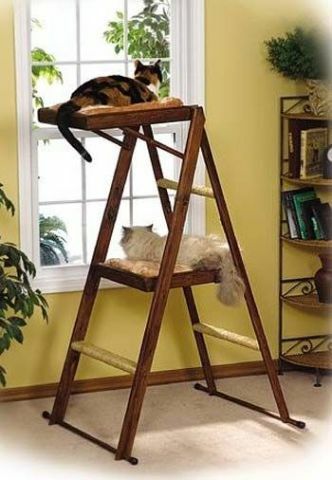 One of the easiest cat structures I have seen is to simply take a step ladder and either tie strong fabric to the rungs (to make a cat hammock) or add wood platforms on top of the rungs of the ladder. is the easiest and most effective way to save money on many things. 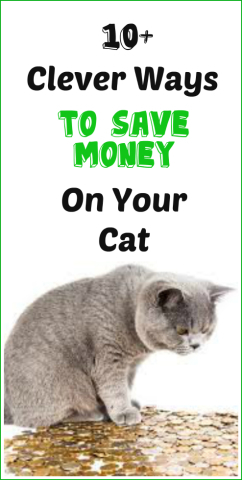 So hopefully, these tips and suggestions will inspire you to find great ways to save money on your cat. With these methods, you'll have more money in your pocket in no time. Don't forget to take good care of your cat, and have fun! Originally published August 2012 and updated June 2016.